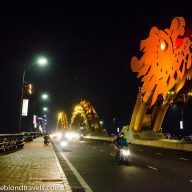 We were driving to check our new apartment in Da Nang, which was about to become a home to us for the next three months. The taxi drove us from Hoi An and we were watching the streets through the windows. The terrain was still flat. There were houses scattered around a big field and there was nothing that could have drawn our attention. Suddenly, out of nowhere, a giant, rocky mountain emerged, changing the area into something a little bit more interesting. 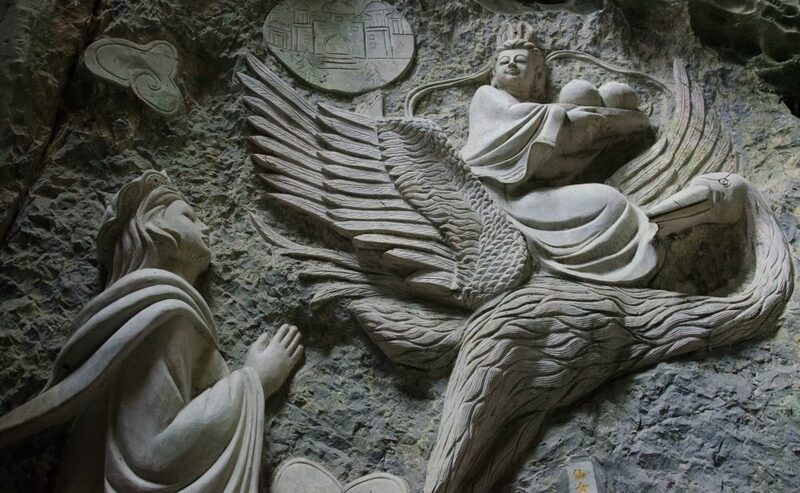 It was surrounded by houses and millions of white sculptures of Buddha and other religious symbols. It looked a little bit out of place, like someone threw it out there without thinking. 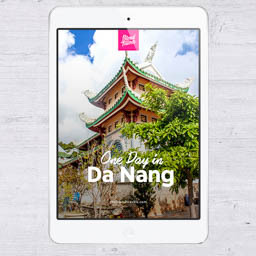 “One Day in Da Nang” is the essential guide for a short trip to Vietnam’s most vibrant city. 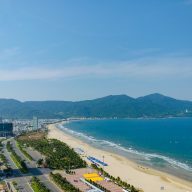 This handy ebook guide includes the most fun and interesting things to see in Da Nang as well as recommendations for best beaches, restaurants, cafés and accommodation. Make the most out of your trip and Find out more! On the side of the mountain we could see a tall pagoda and that made us want to go there. 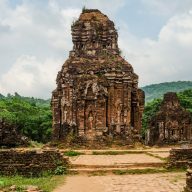 We didn’t know it then, but that was the main hill of Marble Mountains (Ngu Hanh Son in Vietnamese) – a well known place in this part of Vietnam. 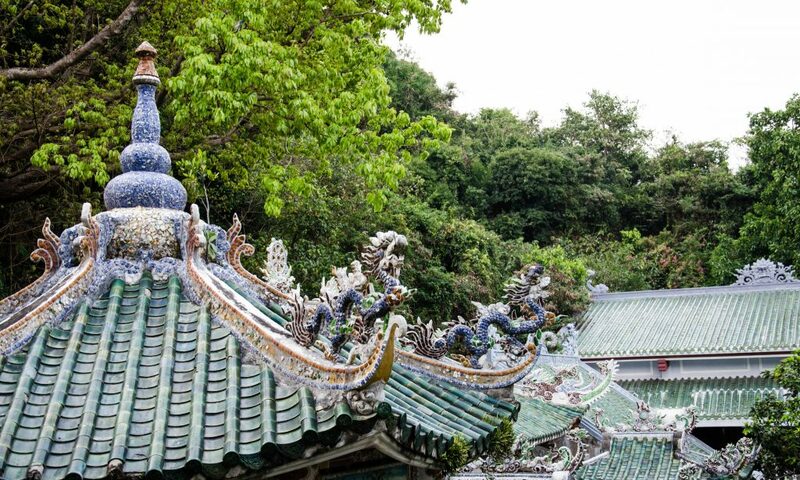 Marble Mountains are the place to go if you want to see beautiful architecture. Marble Mountains are a a cluster of five hills, made out of limestone and marble. 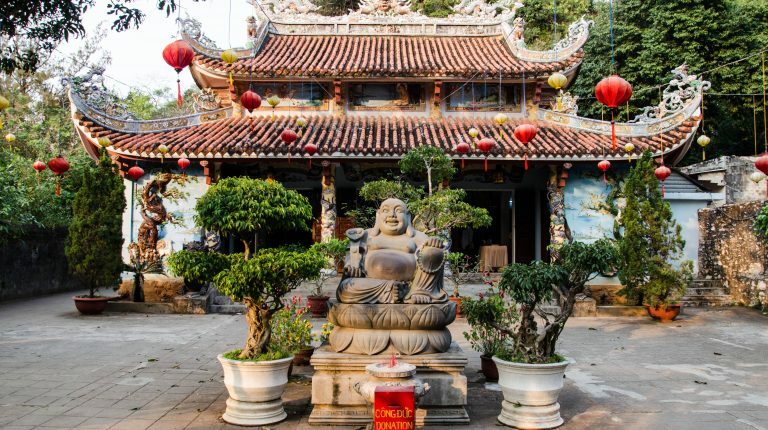 They are located 9 km of Da Nang and are a pilgrimage site with caves, temples, tunnels and peaks. From afar the site doesn’t look like much, but as soon as you get closer it turns out that this is a huge area, just waiting to be discovered. 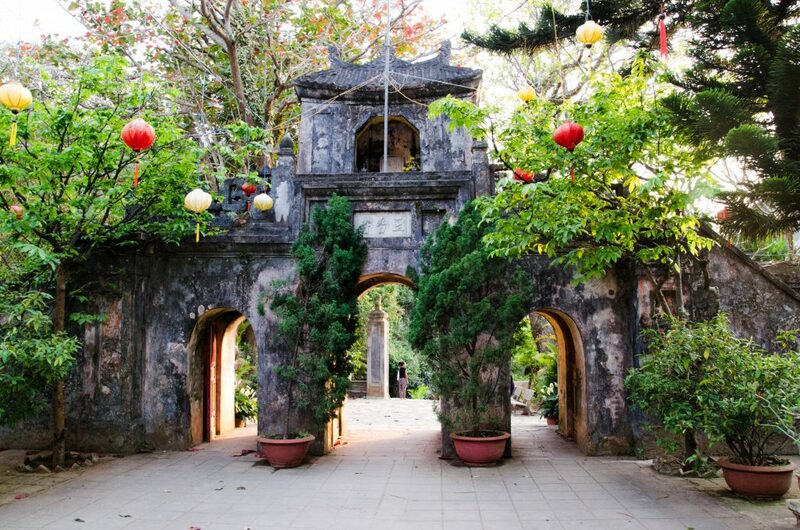 Non Nuoc village, famous for its stone carvings, lays at the foot of the mountains. Here you can visit any workshop and watch the skillful artists at work. The sculptures they sell are usually of impressive sizes, but if you are after some souvenirs you might find something for yourself here, too. The mouth of the Am Phu Cave looms from the base of the mountain. A stone bridge leads visitors over a pond from which carved hands beg for rescue and help. The cave symbolises nine floors of Buddhist hell. In the nook of the stairways you will find sculptures of people being tortured, masks and faces with expressions showing fear and anger peak at visitors. Only screams and groans are missing to turn this place into a really frighting one. 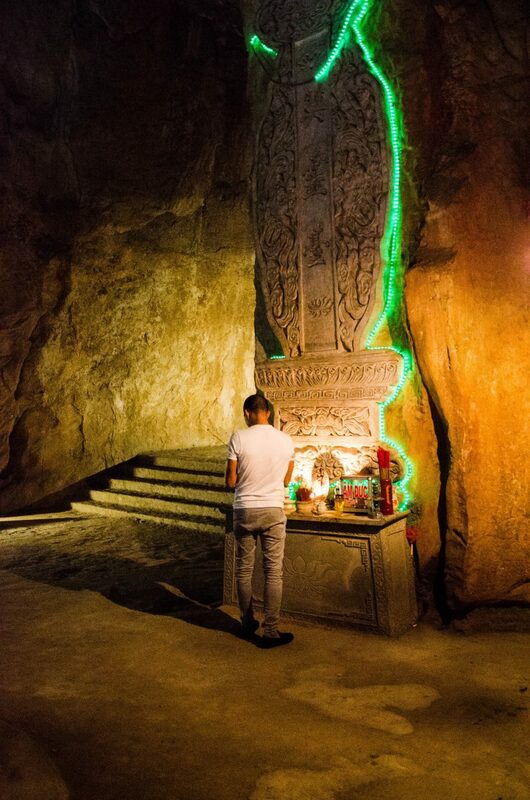 There are altars scattered around the cave with burning candles and incense, where locals come to pray and leave offerings. An altar rests below a stone stele for lost soldiers of past conflicts and a stone Buddha marks a staircase, leading deeper underground. 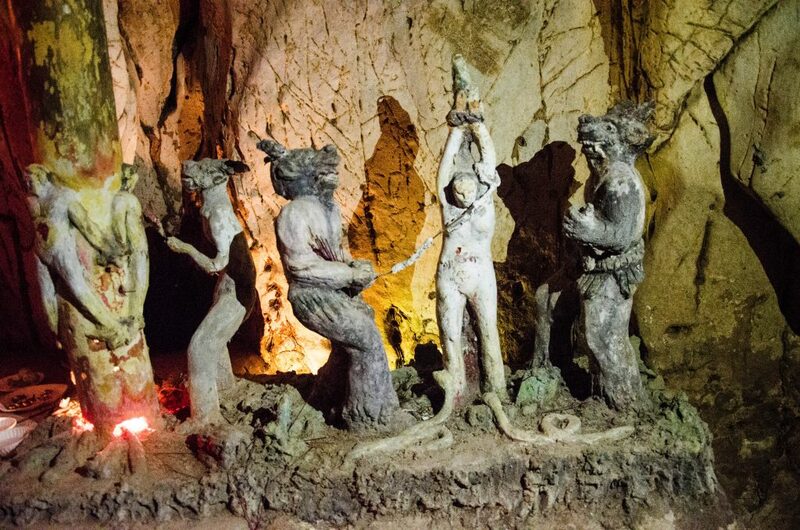 Sculptures like this one shows what awaits those who lead sinful lives. Locals come here to pray and leave offerings. There is also another path, leading up, where beautiful carvings cover the walls. This is the part symbolising heaven. Some steep and narrow steps lead to a small balcony with an altar and a laughing Buddha statue. The carvings reminded us of Christian symbolism. Small altars make this stairway even more interesting. After leaving the cave it is time to explore the other part of the mountain, also symbolising heaven. 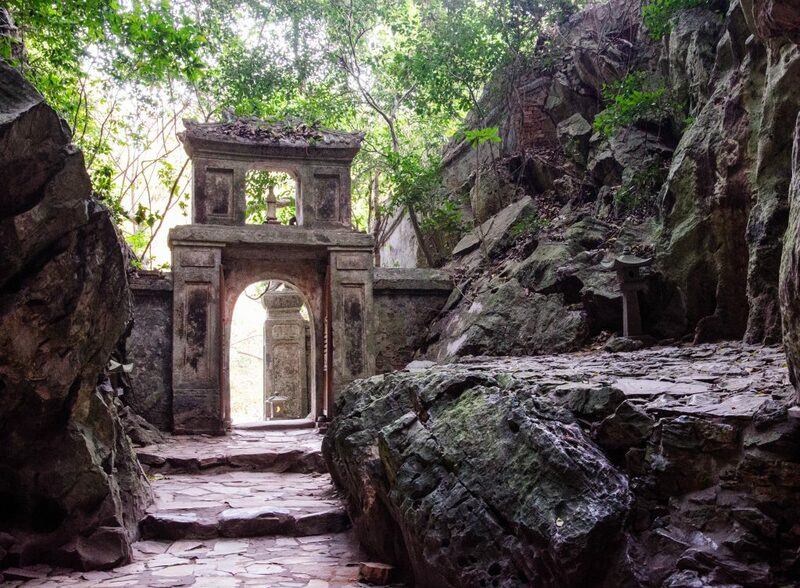 A stone stairway leads up to the top of the Thuy Son Mountain. Visitors can also take a glass elevator and enjoy the views of the city while ascending. It is impossible to see every single pagoda and cave that covers the peak of this mountain. There are beautiful ornate temples almost everywhere. Stone staircases lead to view points, peaks and hidden caves. There are ancient gates, temples and hidden caves everywhere. Everywhere you look there’s something amazing to see. 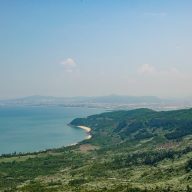 The Road to Paradise, the final ascent, can be a little strenuous, but the views over the city and the beach are worth the effort. We spent around 4 hours wandering around Marble Mountains. We could have stayed there longer if it wasn’t getting darker. 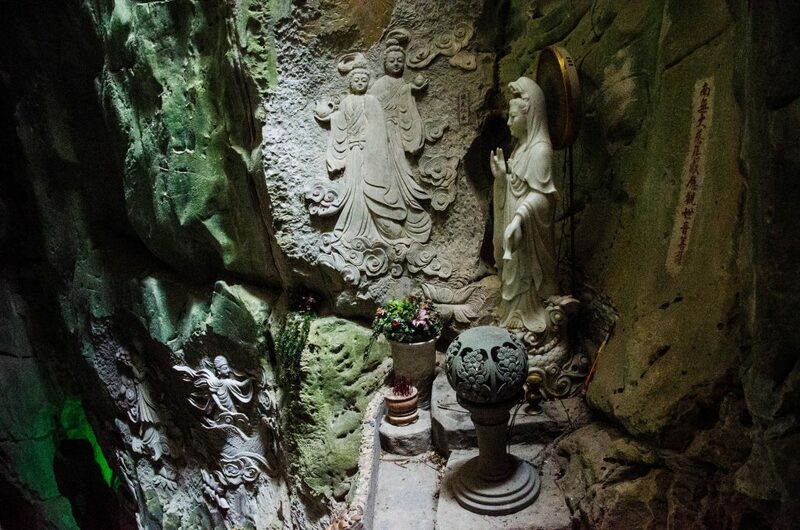 It is an impressive site with much to see and you can spend a whole day there, enjoying the views and discovering little altars hidden in caves. Marble Mountains surprised us with their beauty and their size and we are hoping to go back there for more before we leave. 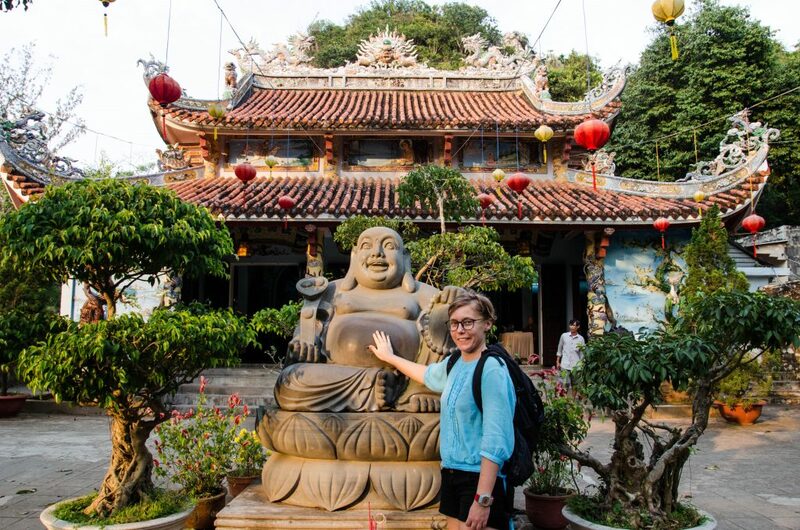 Rubbing Buddha’s belly for good luck. Location: Non Nuoc Village, south of Da Nang, Vietnam. Entrance fees: Am Phu Cave: 15,000 VND, Thuy Son Mountain: 15,000 VND, elevator: 15,000 one way. 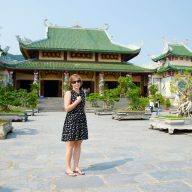 Parking: it is an easy drive to the Marble Mountains from Da Nang. If you have your own scooter you will probably be chatted up by an older lady, who will drive next to you for the last 2 minutes and ask you where you are from etc. She will then lead you to a parking lot. Do not park there as it is much more expensive than a parking, which is located just outside the Am Phu Cave. This one is only 2,000 VND. How to find your bearings: at the ticket booth you can buy a map and I will suggest you do that. We didn’t expect how large the area was and wandered around without a map. 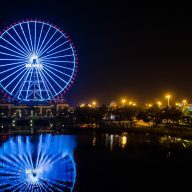 It is best to buy it (20,000 VND) to make sure that you will see everything. Facilities: there are a couple of toilets around the site and every now and then you will encounter someone selling cold drinks. It is best to buy a bottle before doing sightseeing. What to take: don’t wear flip flops nor sandals. A pair of trainers will suffice. Take a bottle of water and a camera that is charged and has an empty SD card as there will be plenty of photo opportunities.